Also known as the city of temples, Bhubaneswar is the capital of Odisha, and one of our final destinations in Odisha. One name that pops up if you ask any local person for food in Bhubaneswar is Lingaraj Lassi – a highly recommended Lassi shop in Shahid Nagar. The lassi comes in two different variants – simple lassi, priced at 45 and special lassi, priced at 55. The lassi here was not like the one I have grown up drinking. The making of this lassi is simple- a layer of deep brown rabdi is settled at the bottom of the glass, then the real lassi – yogurt mixed with sugar and pineapple essence – is added over the rabri and finally finished with another layer of rabri, grated coconut and some cherries. I have tried the lassi at many places in India but never seen such big scale operations of this beverage. Infact, Lingaaj lassi could be the highest lassi seller in India. Big cauldrons of rabri are kept on one side and on the other side are 100s of glasses of lassi. Plastic chairs are kept outside the shop for people to sit and relish the summer drink at leisure. Interestingly, we also tried bournvita lassi at Arjun tea stall near Mayfair hotel, Jaydev vihar. This was a mix of yogurt, sugar, and grated coconut, topped with bournvita. Close to Lingaraj lassi shop are many street food carts selling chaat, gupchup and street delicacies. I tried the papdi chaat at Mayaram’s chaat cart. The papdi is layered with spicy mashed potatoes, sev, onion, coconut, peanuts, coriander, and sweet and spicy chutney. Another different take on chaat from north Indian style, there’s no use of yoghurt in this preparation. I quite loved the khatti culture of Odisha. In every small town throughout India, there are chai addas where people assemble in the morning or evening for a cup of tea to catch up with friends or to discuss every day shenanigans, from their personal life to regional and national politics. In some cities, the chai addas are known as Tapri. Here in Odisha they call them Khatti. My favourite khatti stall in Bhubaneshwar was Khonah tea stall in Shahid Nagar in the evening and another khatti stall in Old town near mausi maa flyover, where we had a delectable experience filled with mesmerizing chai, and even better conversation. In the morning, I was joined by a team of food enthusiasts from Bellthebelly blog and coffebites, a tabloid in Bhubaneswar. We started with the traditional breakfast of Odisha- Poori Dalma at the hugely popular eatery near Ram Mandir – Sri Ram Tiffin Centre. The pooris are made up of whole wheat flour and are quite big in size. A highly nutritious dish, dalma is made with lentils and lots of vegetables. The chopped vegetables like green papaya, eggplant, pumpkin are boiled with lentils. Finally, they are tempered with panchphoran (a mix of five spices – fenugreek seeds, nigella seeds, cumin seeds, black mustard seeds, and fennel seeds. Dalma goes well with everything, be it rice or bread. Next stop was Rabi mausa’s bara shop in Unit 6, Ganga Nagar. Not for the faint heart, he puts his fingers in boiling oil to fry the baras. In Delhi, pappu fish shop in Bara Hindu Rao and Ganesh fish shop in karol bagh also do the same. Over the years, their fingers become desensitised and they don’t feel the heat while frying their wares. The baras, however, were quite different from the other places! The batter of the baras were mixed with chopped onions. They were served fresh with ghughni. What I liked the most was his chhena poda. Chhena poda literally means burnt cottage cheese. I liked the burnt outer skin of chhena poda, and can definitely say it was one of the Chena Podas I had in Odisha! 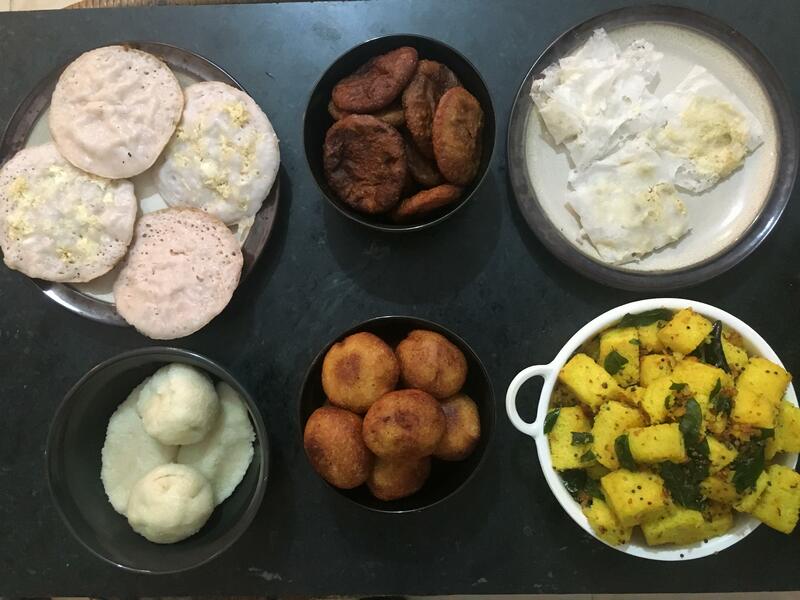 Chakuli, a popular breakfast dish in odisha is served with different combinations of accompaniments. In Cuttack, we tried it with chutney and ghugni. In Bhubaneshwar, we tried it with aloo dum. My favourite still remains Chakuli with chutney at Annapurna mausi’s chakuli shop. The final stop was chai biskut, an open bikers café where the tea is served in kulhads (earthen cups). Owned by Nirali, she generously fed us at her home with Baripada style mutton with murmura (puffed rice) besides the chai. 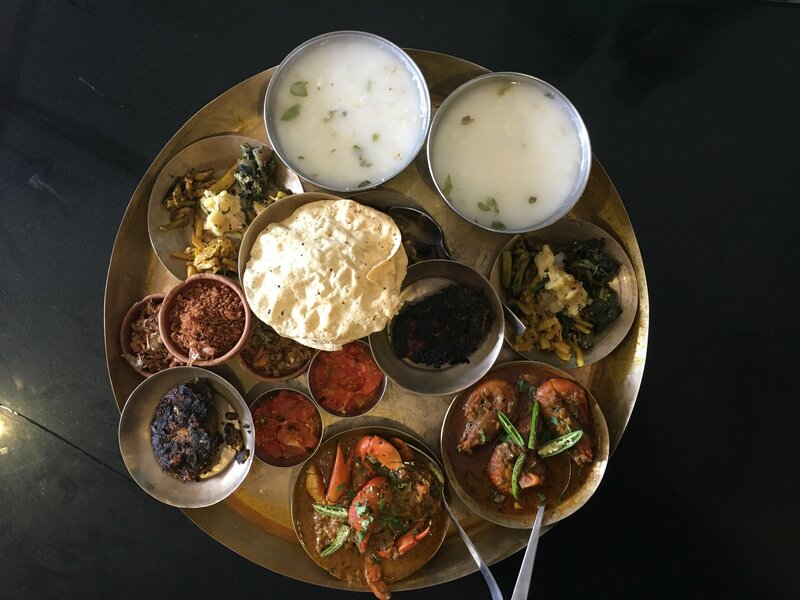 The highlight of the Bhubaneshwar food journey was the traditional Odiya meal at Odisha Hotel. Odisha hotel has two outlets in Bhubaneshwar – Shahid Nagar and Chandrasekharpur. We went to the new one in Chandrasekharpur and were joined by the owner Rajiv Rajveer for lunch. On the recommendation of the owner, I ordered Pakhala, badi chura, mutton kassa, rohi tawa fry, chilika crab, prawn curry, mix bhaja, rice and dal. The highlight of the meal was Pakhala – a fermented rice dish seasoned with spices, curd and lemon. The boiled rice is strained of starch, and water is added into it, left overnight making the dish ready to be served as breakfast/lunch the next day. A highly nutritious meal for the farmers- it keeps them hydrated because of the water (torani), and the rice provides them energy. Pakhala has now made an entry into both mid-range restarutants to fine dining restaurants across India. It is so popular in Odisha that they celebrate Pakhala diwas on March 20th. Pakhala is mostly accompanied with fried dishes. It is simple but truly delicious. My other two favourite dishes at Odisha hotel were badi chura and kakharu phula bhaja. Badi is dried lentils cake, crushed and seasoned with garlic and onion. Kakharu phula bhaja are pumpkin flower fritters. I loved pakhala with these two combinations. Poda Pitha made with rice flour, black gram,jaggery, dry fruits along with spices such as ginger,cardamom and cloves which is part of a special festival in Odisha called Raja . Kakara Pitha- made with wheat flour/semolina for the outer covering with a filling made from coconut and jaggery. Arisa Pitha, which is mainly made during odia marriages is the most popular delicacy made from rice flour, jaggery, desi ghee and sesame seeds. This pitha is crisp from outside and soft from inside. It is also known as Ghee Pitha as it mainly made with desi ghee. Manda Pitha, which is another variety of pitha made during Manabasa Gurubar Puja held in the holy month of Margashir. The traditional variety uses steamed rice flour for outer covering and coconut and jaggery for the stuffing. Chinchu patarapitha, which are needle thin pancakes made from a batter of rice flour, and made with a muslin cloth in place of a laddle to come up with the super soft pancakes. Muan pitha, which are steamed rice and lentil cakes made with turmeric ginger and green chili and tempered with mustard seeds and curry leaves and served with chutney. I got to try another kind of pitha – Enduri Pitha, at a magnificent property Kila Daljoda. 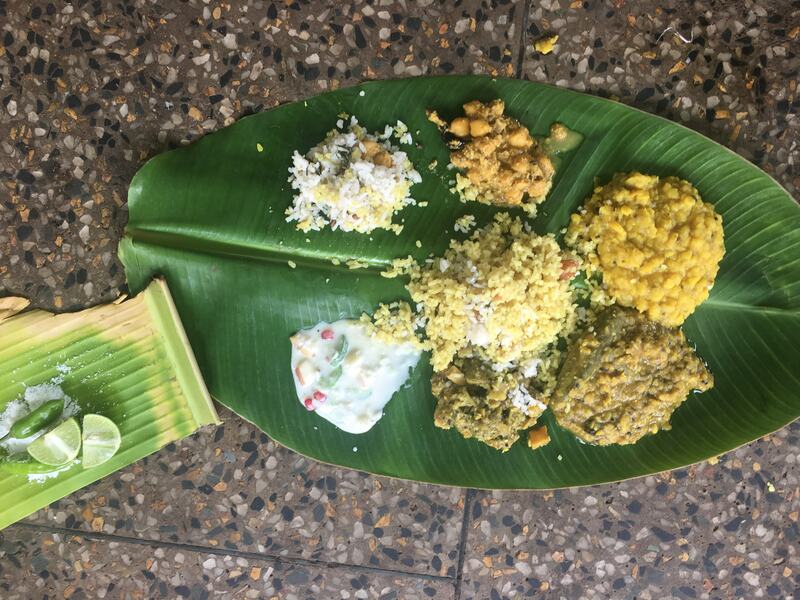 The pitha was wrapped in turmeric leaves and served with date palm, jaggery, and coconut chutney. It is made during Prathamashtmi- a celebration of the eldest child in the family. The most incredible and incomparable experience was of having prasad at ananta Vasudeva temple in the old town of Bhubaneshwar. The temple is easily accessible by all. One can also see the prasad preparations inside the temple and purchase them at anand bazar. Anand bazar is a part of the temple where prasad can be purchased from different food stalls. The food is served on dried leaves and in clay cups. And the last stop in Bhubaneswar was Nimapada sweets in bapuji nagar. Here we tried the famous chhena jhilli – fried cottage cheese dipped in thin sugar syrup, which was the perfect end to this delicious journey!